Royal 03: keeping things moody. 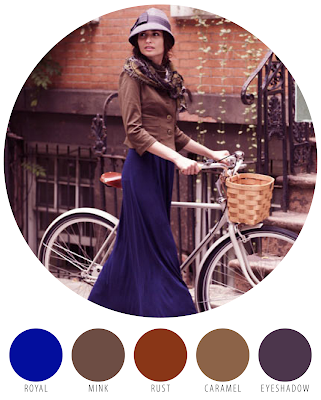 Sometimes a saturated color like Royal blue is easiest paired with another bright color. There's nothing wrong with that at all. On the other end of the spectrum, a lot of power can be put together by pairing several dark and less-saturated colors with the main color event. Image via Anthropologie. Before you end your Royal Blue combinations, can you find some colors like I usually wear that will go with the royal blue? I love the royal blue. Can you go on either side of blue - toward the purple and greens? It would be very helpful when shopping for clothes. @mom - I can set up a few more palettes for Royal. It's one of my favorites colors too (so close to Cobalt) and I think it looks good on everyone. Look for more palettes next week. I'm glad that I'm not the only one loving royal blue and I like how your colors are perfect for fall. I get so excited for season changes even though I love summer. @alison - I agree. It's so nice when you can get an idea of how colors transition from season to season. I'm looking forward to seeing how this year's colored jeans make it in October.